And just like that another hectic wedding season starts calming down. I have loved the challenges we faced this season. We have worked once again with the most wonderful brides. Bride-zillas seem to be a myth in my line of work. I get asked time and time again @Tell me about the bride-zillas. But the truth is I am yet to meet one… Well there was one this year but lets not talk about that. This years wedding season I worked on weddings all over Wales from St Davids hotel in Cardiff to Fonmon castle to a tippee in a garden in Hereford. I always get asked which has been my favorite and this year I really struggle to pin point which it would be. Everyone always assumes its the big affairs, the big show stoppers that would be my favorite, but not always. I love the small simple weddings just as much. For me its not always about the amount of floristry you get to do, don’t get me wrong there have been some amazing things I’ve got to make this year, but for me its more about the moment you deliver the bridal bouquet and the brides says its exactly what she wanted, that’s always the stand out moment for me. This year however a lot of flower moments stand out, Such as Beth and Ian’s wedding in Felin Newydd house. This couple had hired out this beautiful house for their two day wedding extravaganza. I met Beth 18 months before the big day and knew straight away she was a bride Id love to work with. She had strong ideas about the look for the day and was open to ideas suggestions and the possibilities for decoration for the day itself. All in all the set up took two days and WOW what an amazing wedding!! Because we had to move items around after the outdoor ceremony we were lucky enough to see the service. Beth wore a beautiful dress with scalloped lace from ‘The Mews bridal’ in Bristol which was so delicate and beautiful she looked stunning. It was a real honor to see her walk down the aisle towards the love of her life,Ian, especially with my bouquet front and center! This wedding was full of flowers with strong pinks and peach tones, a tonne of mixed greenery garlands a floral arch for the ceremony and a gorgeous photo booth. Oh and of course the bridal bouquets. Its safe to say Beth is certainly a bride I will remember fondly for a long time to come, a real girls girl who trusted me with her incredible very special day. Thanks Beth. Hannah and Lloyds wedding was also one of my stand out moments of the summer. In contrast to how organised Beth was with all the design ideas and her vision for the day all I had to go on with Hannah was she loved the soft peachy tones with ivory. She loved a little nod to the informal wooden boxes that have become popular. They got married in their local church in Penarth and the reception was held at LLanerch vineyard in their lovely marquee. We had the challenge of creating a floral arch at the church even though there was no frame work there to attach to. It was a very high archway and these archways are not light so this was quite a feat to get it up, I was pleased though it looked great. We also had to install light fixtures at llanerch on the four light fittings in the marquee. 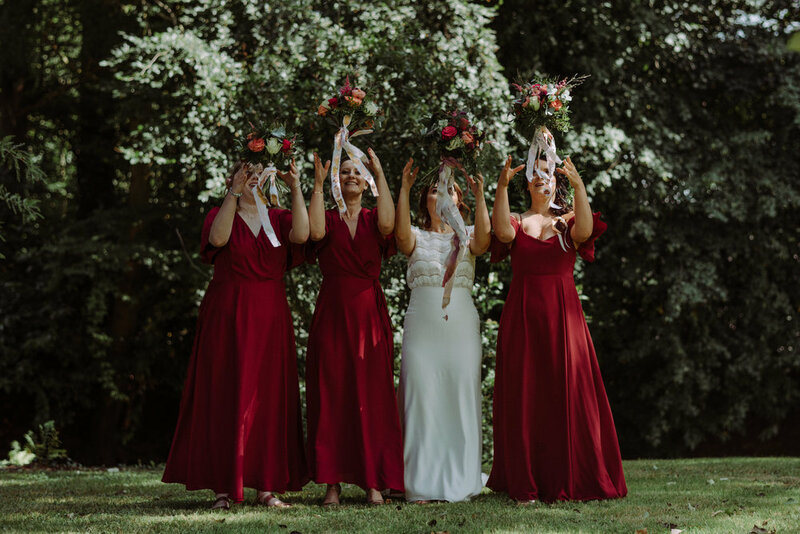 We had discussed using eucalyptus and elements of the bridal party flowers in theses and the effect was so effective when they were all finished. Again with this wedding we had to relocate some items from the church to the venue so I got to see Hannah arrive, she looked incredible. The groom is a close friend of my brothers who was actually a best man and it was a real pleasure to be involved in this lovely couples big day.